Quests has broken 50k downloads! Update: Quests development has continued on this page at SpigotMC. Quests is an ever-growing, work in progress. A completely open system allowing for intricate Quest design and customization, it gives you the tools to immerse your players into a world of your creation, and have them be met by the challenges you present. Feel like contributing to the project? All donations are extremely appreciated and help boost the project productivity. 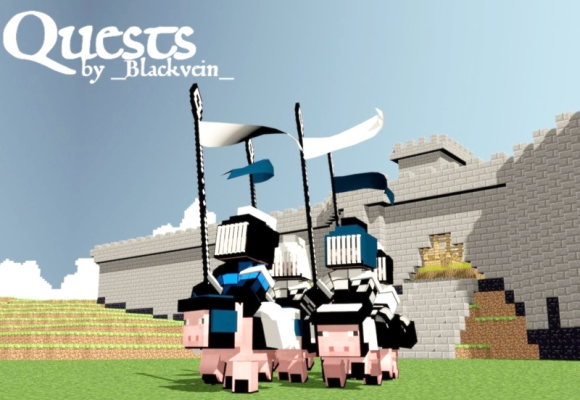 An extensive Questing system, where players may take different Quests, complete them for rewards and a sense of accomplishment. In a nutshell, what features are there? Citizens 2 support! Your Quests can be given by NPCs! In-game Quest editor! You never have to touch the file containing your Quests! *NEW* Language file! You can translate Quests into your own language, or modify the menu/message formatting. *NEW* GUI Display! Quests can be given from NPC's with an inventory GUI display. *NEW* Quests API! The three different Quests APIs allow you to build your own requirements, rewards or Quest objectives. Denizen support! Denizen scripts can be run at certain points during a Quest. WorldGuard support! Quests may require that you be inside a specific WorldGuard region to take them (via command). PhatLoots support! Quests may give PhatLoots as rewards. mcMMO support! Quests may give mcMMO skill levels as rewards. Quests may also require certain mcMMO skill levels to accept. Heroes support! Quests may give Heroes class experience as rewards. Quests may also require certain Heroes classes to accept. Customized Quest names, messages, Quest requirements, and Quest rewards. Quests are divided into Stages. Stages may have any number of Objectives. An Event system where various things may happen at certain points in a Quest, such as mob-spawning, lightning strikes, potion effects etc. Leaderboards for Questers with the most Quest Points. Quest Points are an available reward from Quests. You may also choose to install Citizens 2 if you haven't already. It is highly recommended to get the full experience of Quests. Note: If you are downloading Citizens, make sure to download a Citizens 2 version, and not a Citizens 1.x version. Okay, I'm setup. How do I start making Quests? Don't want this? just set snoop, in the configuration, to false.